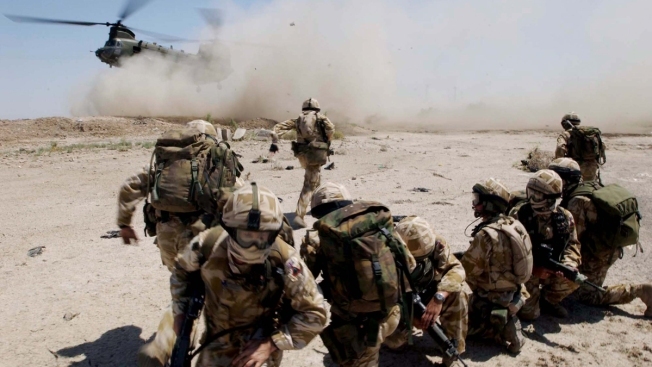 In this July, 2004, handout image from the British Army, soldiers from the The Royal Welch Fusiliers mount helicopter-borne Eagle vehicle check points around the southern Iraqi town of Basra. Britain's long-awaited report on "the way decisions were made and actions taken" before and during the Iraq war is due to be published on Wednesday, July 6, 2016. It's been seven years and millions of dollars in the making, but the colossal report on Britain's role in the Iraq war will finally be published Wednesday, according to NBC News. The wait for the results of the Iraq Inquiry have left former Prime Minister Tony Blair in the hot seat amid longstanding allegations he lied in making the case for the U.S.-led 2003 invasion. How hard the "Chilcot" Report — named for the inquiry's chair, Sir John Chilcot — comes down on Blair will be closely watched in a country grappling with anti-establishment anger and political uncertainty. But even for the most avid bookworm, reading the whole report will present something of a challenge. The 12-volume report will run for a staggering 2.6 million words — around 33 times longer than the first "Harry Potter" novel and almost 4 ½ times longer than Leo Tolstoy's Russian epic "War and Peace."